Now that the nights are staying warmer, we’ve finally rolled out our trusty grill. Over the years, it’s become tradition in our household that when it comes to grilling, my husband, Andy, takes over. I’m not sure why I’ve never intercepted. He likes his meat charred until it resembles an inedible hockey puck, while I prefer my meat to come off the grill retaining some amount of life. Recently, Andy was on the road, and I decided to fire up the grill all by my lonesome. To my delight, I discovered there’s something deeply satisfying about manning a grill. Sorry honey—from now on I’m the grill master. I filled the grill grate with an assortment of seasonal veggies that I had simply drizzled with olive oil and sprinkled with sea salt. The asparagus, zucchini, and squash all turned out sweet and juicy with just the perfect amount of flavorful charring. The best part was there were no pans to scrub after I devoured dinner. 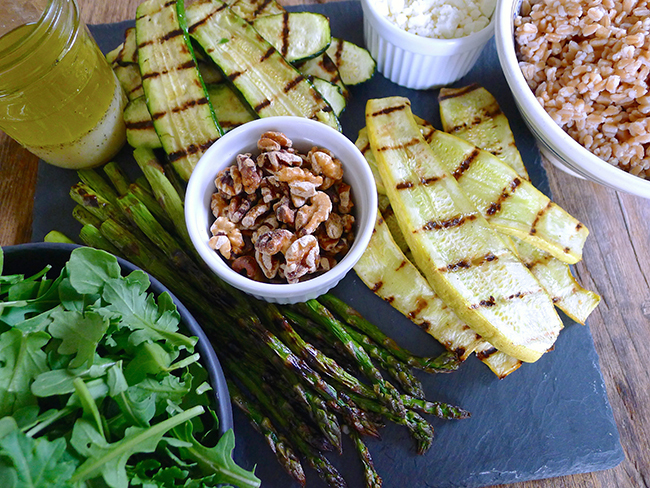 Next time you’re grilling, cook up an extra large batch of your favorite seasonal vegetables—get creative with the assortment. Serve them the first night hot, right off the grill and the next day toss the leftovers into this satisfying salad and call it lunch or dinner. Cook the farro: In a large saucepan, place the farro, 3 cups of water, and salt and bring to a boil over high heat. Reduce the heat to low and simmer, covered, until the farro is tender but still chewy, about 20 to 30 minutes. Drain the farro, rinse under cold water, and drain again. Set aside to cool. Make the dressing: Combine the olive oil, lemon juice, lemon zest (if using), garlic, miso, salt, and pepper in a small mason jar with a lid. Shake vigorously to combine. Assemble the salad: In a large salad bowl, combine the farro, grilled vegetables, arugula, ricotta salata or feta, and walnuts. Toss with the dressing. Taste and season with additional salt and pepper, if needed. Cover and chill in the fridge until ready to serve. Elyse Kopechy is a food writer, recipe developer, whole foods advocate, and marketing consultant. After 10 years working for Nike and EA Sports, Elyse decided to pursue her passion for talking about and writing about food. She went to NYC to study culinary nutrition at the Natural Gourmet Institute and has taken cooking classes throughout Europe, Africa and Asia. Follow Elyse’s adventures in the kitchen @ElyseKopecky.